We live in confusing times. Between Nair (for men), yoga and the music of John Mayer, testosterone is often drowned out in a sea of metrosexuality. Sometimes you need to assert your masculinity the old fashioned way—with hot lead and raw meat. Luckily, site59.com's "Beef and Guns" dinner package is God's gift to the hormonally-challenged man: $98 for the chance to shoot 150 rounds of ammo and dine at one of Manhattan's oldest monuments to beef. Your evening starts at the West Side Rifle & Pistol Range where you're greeted by a sign selling gas masks, survival kits and chem suits—everything you need for a great night out on the town. A picture of Robert DeNiro in Taxi Driver, lockers, and 50-cent cups of coffee add to the charm. After a quick primer in gun handling you'll be unleashed to throw lead down-range at paper silhouettes. OK, so the .22-caliber pistol you'll be sporting won't make you look like Dirty Harry—but then again, what else have you been packing lately? 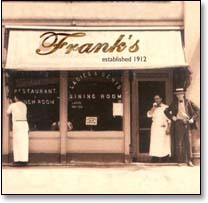 Once you've shot your load, it's off to Frank's Restaurant, a no-nonsense steak joint that's been catering to neighborhood carnivores since 1912. Order yours bloody and relax. Tonight your date will have no doubt that under your Seven Jeans and Armani shoes you're really just a cowboy at heart.